It's finally F R I D A Y !! Well it was Birmingham restaurant week and we have until Sunday to enjoy it together. Max and I are total foodies, we like to consider it our hobby. Some people enjoy hiking, scrapbooking, or cycling. As for Max and I we enjoy food - eating it, cooking it, and shopping for it. It's our thing! So a full 10 days of awesome restaurants offering speciality menus and speciality prices - now were talking! Birmingham's restaurant scene has such personality and charm and BRW is the perfect time to try some new places. 36 restaurants around the Birmingham area are teaming up to offer fixed-price lunch deals for $5, $10, & $15, and dinner specials for $10, $20, and $30. With local favorites like Rojo and Maki Fresh, and impressive names in fine dining like Hot and Hot Fish Club and Bottega there's certainly something for everyone. Below is a list of the participating restaurants in this years Birmingham Restaurant Week. 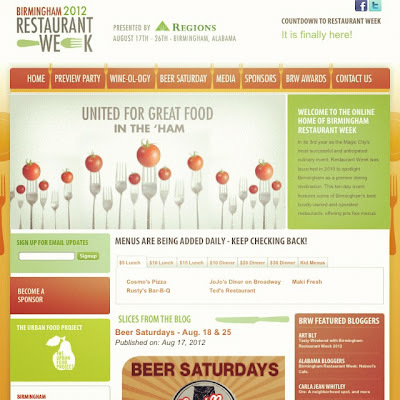 To find out more visit www.bhamrestaurant-week.com. I love your blog, you are so cute! Hi Darren and Alana - thanks! I'm so glad that you are a fan of Something Lovely, thanks for following along! Congrats to you both on your new life together + your new blog. You two make a beautiful couple. it's Friday - let's have a cocktail!